Enjoy the easiest Instant Pot Beer Braised Short Ribs! I am celebrating #NationalBeerDay today and what better way than some amazing braised short ribs cooked in beer, specifically Guinness beer, of course! The short ribs are fall off the bone, finger licking good delicious! 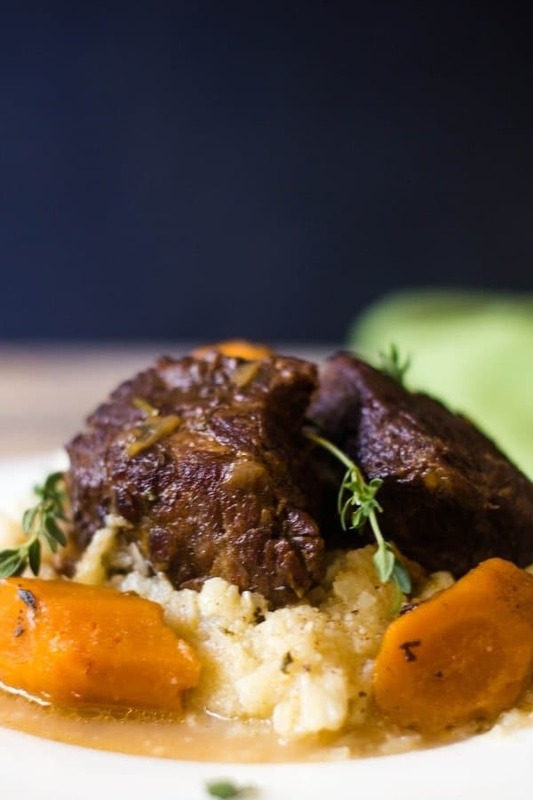 Use your Instant Pot to make this short ribs recipe and in less than an hour, you will have an amazing meal for your family and friends! Instant Pot Beer Braised Short Ribs are one of my family favorite meals! To celebrate National Beer Day, what better way than to bring you a tender short rib recipe braised in Guinness beer. 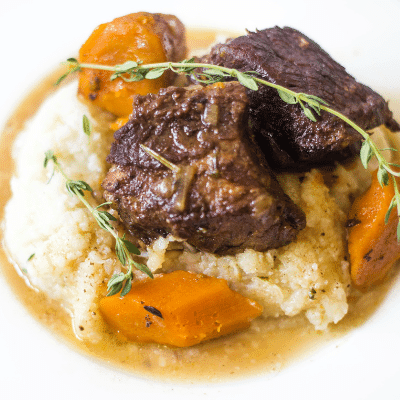 Feel free to use any darker ale to create this braised short rib recipe. 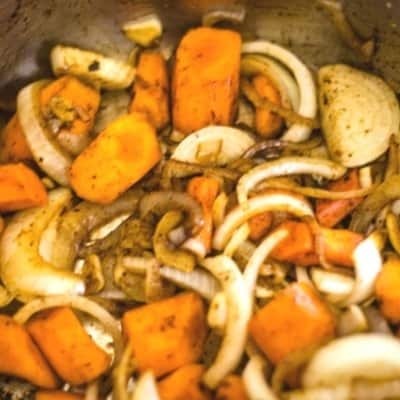 I add carrots and onions to the instant pot which layers more flavors to the broth. These delicious beer-braised short ribs are awesome over mashed potatoes. To keep this a low-carb meal, make buttermilk mashed cauliflower to pair with these ribs! Oh my, so good! I was late to the Instant Pot parade and got mine just a few months ago and I have not stopped using it! I have made a spot on my kitchen counter because it is so useful. Even my kids are using the Instant Pot because it is such a game changer for easy meals! I love braised beef and poultry, especially during the fall and winter months, major comfort food for my family. 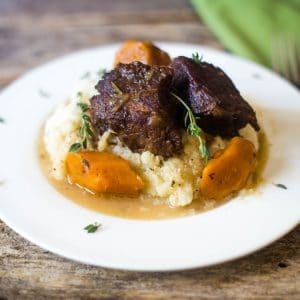 I absolutely love using the Instant Pot to make this braised short rib recipe because its easy, quick, and delicious! The beef is so tender and my family requests it often! Also, the big one, easy clean-up! How long does it take to make Instant Pot Braised Beef Short Ribs? The ribs and veggies are sauteed, which takes about 10 minutes. The beef will braise in the instant pot in about 35 minutes on “stew”. Approximately 45 minutes to a delish meal! What should you look for when choosing beef ribs to make braised beef short ribs? Short ribs cut on one bone about 1/2 to 1 pound per cut is best. I tend to use an English cut which gives a good amount of beef to be braised. 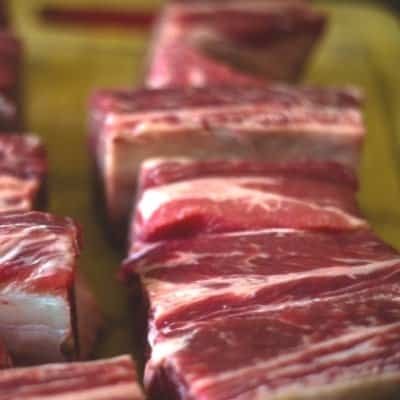 Can Boneless Beef Ribs Beef used to make Beer Braised Short Ribs? I have not used boneless ribs to make this particular recipe. If I were to use boneless, I would shorten the cook time to about 25 minutes, depending on the size of the beef. Keep in mind, the bones do add amazing flavor to the broth. 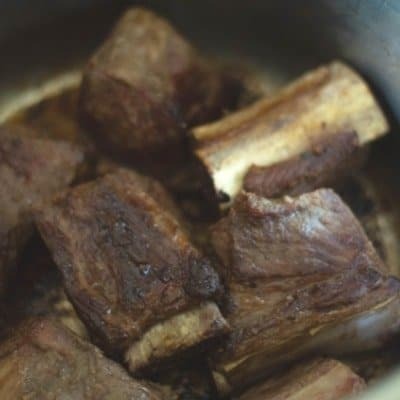 How can I avoid mistakes while making any Instant Pot braised short rib recipes? After browning the ribs and adding liquid, be sure to scrape up the brown pieces that may have stuck to the bottom of the instant pot. This can cause the “burn” message if brown bits are left in the bottom of the pot. when transferring from sauteing to stew or any other mode, always press off and then chose the next setting. This also prevents burn from happening. The size of the beef ribs can affect the time. My ribs were about 3-4 inches long. If you use longer ribs, add about 5 minutes. What goes well with Beer Braised Beef Short Ribs? 8 quart Instant Pot, I use this pot! It works for my family size so well! My favorite bowls to enjoy this braised beef and many others. The bowls are wide and pretty. 2 cup fat separator, comes in a variety of sizes. This is a favorite to remove fat, which means extra calories from gravies and sauces. Don’t have an Instant Pot, please buy one! 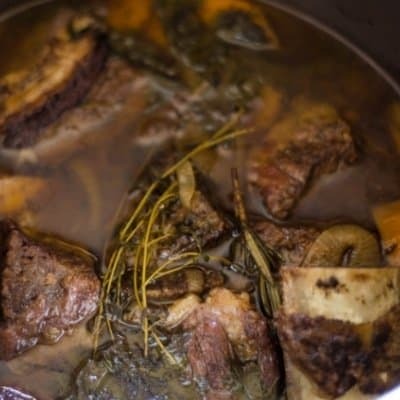 How to make beer-braised beef short ribs in the oven? Preheat to 300 degrees. Season flour with salt, pepper, onion powder, and garlic powder. dredge the beef ribs in the seasoned flour. In a large dutch oven, over medium heat, add olive oil. Sear short ribs. Remove from heat. Add the onions, carrots, and garlic, saute for about 5 minutes. Add the Guinness, beef stock, Worcheshire sauce, and tomato paste. Scrape up the brown goodness at the bottom of the dutch oven. Add back in the short ribs. Place lid on the pot and place in the center of the oven for about 3 hours. I always try and separate any fat and serve as above. Liberally Season short ribs with salt, pepper, onion powder, garlic powder. Set Instant Pot to Saute, 15 minutes. Sear the short ribs and set aside. Add in the carrots, onions, and garlic. Saute for 2 minutes. To the Instant Pot, add Guinness, beef stock, tomato paste, Worcheshire sauce, black pepper. Add back in the short ribs, fresh thyme leaves, rosemary, and parsley. Place lid on Instant Pot. Make sure vent is closed. Press Stew and set Instant Pot to 35 minutes. Once complete, auto release, ( check manufacturers instructions). Turn Instant Pot off. Remove the short ribs and veggies to a platter. Cover with foil. Make a slurry with cornstarch and some broth, add into Instant Pot. Turn Instant Pot on to Saute, 5 minutes to thicken the gravy. Serve over buttermilk mashed cauliflower, mashed potatoes, egg noodles, zoodles, or roasted spaghetti squash. If you have enjoyed this tasty beer braised short ribs, giving it a 5-star rating and share comments below would be super helpful! Make tasty Beer Braised Beef short ribs in the Instant Pot! Have an amazingly flavorful meal in 45 minutes! The most tender beef short ribs filled with flavor from Guinness Beer! This will be a family favorite. Oven braised recipe included. In a small bowl, combine garlic powder, onion powder, Kosher salt, and ground black pepper. Rub the short ribs with the garlic powder mixture. Set the Instant Pot to saute on High. Add the olive oil, when it reads hot, add the seasoned short ribs to brown. (see note 2) Once browned, remove ribs from the Instant Pot, set aside. Place the lid on the Instant Pot and Seal it. Turn the Vent Knob to closed. Press "Stew" and set for 35 minutes, on high. Once the timer goes off, let it do a natural release for about 10 minutes. Then open the valve to release the remaining pressure in the pot. Hit "Cancel". Remove cover, remove the ribs and carrots to a large bowl and cover with foil. Make a slurry with the cornstarch and some of the liquid and mix well, until smooth. Pour into the Instant Pot and press "Saute" adjust heat to medium heat. Let it cook for about 10 minutes to thicken the sauce. 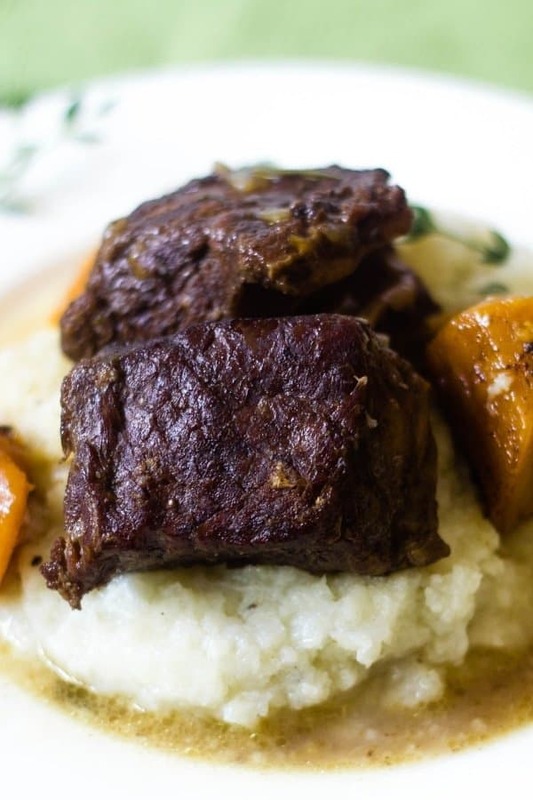 Serve the short ribs over mashed cauliflower, mashed potatoes, or egg noodles and enjoy! Note 1: I limit my sodium, I find this has enough salt without any extra. Taste the sauce before adding salt. Note 2: Let the short ribs sear about 5 minutes. Don't move them around. It is best to let them sear by leaving them alone to brown. Then flip to brown the other side. Note 3: When adding the Guinness into the Instant Pot, it is important to use a spoon to scrape all the brown bits off the bottom of the pot. ** If you do not remove all the brown bits you may get a burn notice on the Instant Pot** Plus those brown bits are added flavor to the gravy. Note 4: It is important to shut the Instant Pot off after the "Saute" of the beef and veggies are done and the Guinness is added "Saute". This prevents the "Burn" message. Don't switch from the saute to stew button. Note 5: If you do not have fresh herbs, they really add amazing flavor, add dried herbs about 1 teaspoon each. As we celebrate #NationalBeerDay, I have to thank Camilla, who runs Culinary Adventures with Camilla. for hosting this wonderful day of recipes relating to Beer! As I read through the step by step instructions, I began grabbing ingredients out of the cupboard. When I got to the cooking, I realized that the ingredients list (with amounts) is missing the Worcestershire sauce. Can you reply here with your recommended amount and update the recipe? Hi Jennifer, I updated the recipe to include the Worcestershire Sauce. It is 1 Tablespoon. Thank you so much for letting me know it was not there. That’s just the perfect comfort food to eat all winter long, can’t wait to make it! Thank you, Andrea, I hope you enjoy the short ribs! Oh I love my instant pot! These look absolutely delicious. I’ll be adding these short ribs to our weekly meal plan for sure. Me too, Alexis, I love the Instant Pot! I am so glad you enjoy the short ribs and I hope you check back in with me after you make them. I so appreciate you visiting my site. Thank you so much for taking the time to write such a sweet comment! I truly appreciate it! This recipe has two of my favorite things- beer and short ribs! Can’t wait to make it! I am happy you enjoy the short ribs Jackie! You are right=, can’t go wrong with beer and beef! YUM! Perfect looking dinner!!! My husband would love this! These step-by-step instructions are so helpful!!! Printing this recipe so I can make it for dinner this week!!! Thank you so much Amanda! I hope your hysband enjoys the short ribs. I hope you check back in after you make these short ribs! I love my electric pressure cooker for this very reason – you can make such delicious meals in no time at all. These beer-braised short ribs look absolutely delicious! Thank you so much, Jenni! I so agree, I have become so reliant on the Instant Pot! I have not found one recipe yet that I cant convert to it and it tastes amazing! Mmmmmm that looks like it will just melt in ya mouth! So yummy! Thank you so much Nicholas! I appreciate you stopping by and for your kind comment! I made these tonight using boneless ribs and holy moley they were amazing!!!! A total hit with my family! Hi Chelsea, Thank you for taking the time to visit my site and making these short ribs. You made my day! I am so happy you and your family enjoyed the recipe! Have an awesome weekend! I am drooling over these pictures! Ithis is the perfect recipe for a chilly day! I’m pinning this to my recipes to try board. Aww, thank you so much Anne! I am so glad you enjoy the recipe! Wow, you had me at BEER! I love this and I need to get a lot better use out of my Instant Pot, lol. I was a little late in the game also when buying my IP. I love it and will continue to look for great recipes to make in it. These IP beer braised short ribs look outstanding, delicious and easy!! Love how quick and comforting this recipe is! Sounds perfect for the fall and winter! YUM! Thank you so much Kelly! 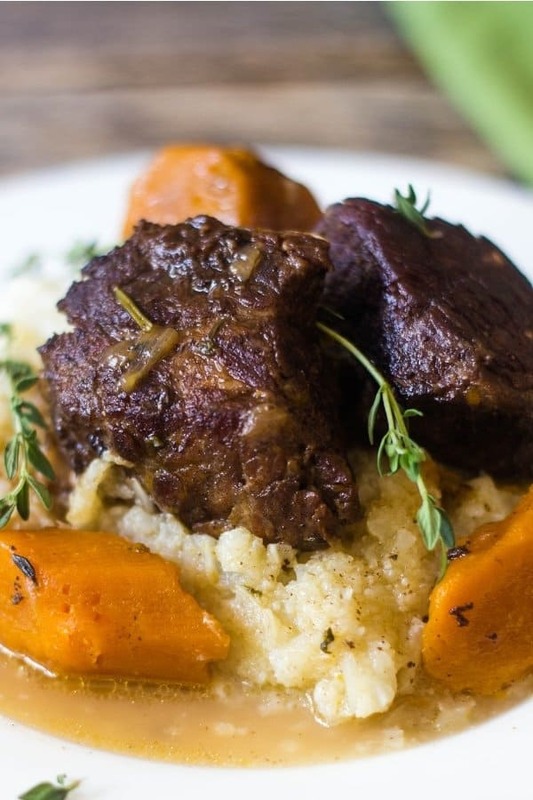 These short ribs are really awesome for any fall/winter evening! Thank you for visiting! I’m even later in the instant pot game as I haven’t got one! And I keep reading about recipes that call for one and I feel like I’m missing out on so much. The problem is that I have a small kitchen and I’m afraid that once I start using it I’d need to find it a place as I wouldn’t stop anymore 😀 I guess I have to make some kitchen planning and get myself one… maybe for Christmas? Eva=, not sure how many people you are cooking for on a daily basis. The Instant Pot has different sizes. I do have a large one and I need it for the amount of people I cook for daily. Cooking in small spaces is something I have always dealt with too, this pot, I made space for because its amazing! Either way, use my oven braised option, so good too! I do not like drinking beer, but I do like to cook with it. These ribs look amazing, and I bet they are so tender. I will have to give these a try in my regular pressure cooker. I know hubby would love them for sure. I’m so glad you enjoy the recipe! These ribs are great in a pressure cooker too! I’ve made short ribs many times, but never in an Instant Pot. I will have to try this – it’s the perfect fall comfort food. Allison, the Instant Pot makes braised ribs even easier to make. I hope you make them too! THIS looks incredible! OMG I can’t show this to my hubby heheh 😀 I can’t wait to surprise him with this deliciousness. He’s a huge rib fan. Awesome Natalie, I hope your hubs enjoys the ribs! What a beautiful dish to welcome the fall weather with. This looks so hearty and comforting…nothing can compare and I love the ease of preparing this in the instant pot. How delicious! Thank you so much Catherine! These Instant Pot short ribs are a fall comfort food favorite! You got me with Guinness beer that is one of flavorless beer I like to use in cooking. This perfect short ribs. I like that you made it in instant pot. which makes it easy. Lot of fresh herbs in the recipe. Thank you Swathi! This is a super easy way to make braised ribs and the INstant Pot really makes it simple! I have an instant pot and I don’t use it nearly as much as I should. This recipe looks simply delicious and using the instant pot makes it so much easier. Oh Celeste, this is a good recipe to break out the Instant Pot! Wow! Thanks plenty for this! This seems wonderful and without difficulty make.actually this appears scrumptious! This is an easy recipe for everyone to follow! Enjoy! Electric pressure cookers are the perfect way to make tender, fall apart short ribs like this but your recipe looks extra delicious. I love that you’ve added Guinness to this recipe. I bet that adds some wonderful flavor. Thank you Jenni! This is a family favorite! Enjoy! You may have been late to the Instant Pot parade but I haven’t even left the starting gate. I see all these tremendous recipes that you can make in the Instant Pot but I just don’t have a place for it — we still haven’t found a house to move into. Anyway, I will try to adapt this recipe in a regular pot on slow cooker. The dish sounds wonderful I bet I could adapt it. I hope you enjoy these braised ribs. I do have the instructions to make these in the oven in the post! Once you move, I hope you get an Instant Pot! I love beer-braised beef and this looks so good. Love the step by step pictures and well-explained post. I cannot wait to try this. Sounds so good. Thank you Veena, I am so glad you enjoy the recipe and my instructions! 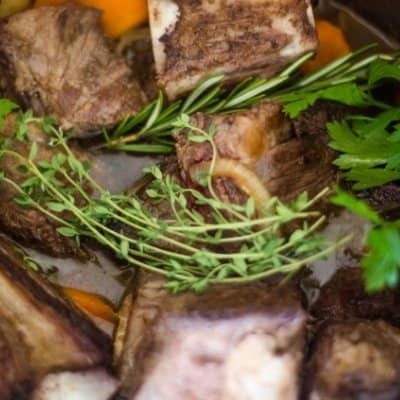 I just bought short ribs this morning and didn’t have a solid plan, happy to have come across this recipe! Excellent Michelle! I hope you enjoy the short ribs! I have got to get your Guinness gingerbread recipe! sounds amazing Karyn! I hope you enjoy the ribs as well! What a great meal to feed the hungry family. The meat looks so tender….and delicious. This would be a great freezer meal too….perfect to warm up on days you don’t have time to cook. So much better than takeout. Absolutely Gloria! These are awesome and they are freezer friendly too! I agree to leave the bone on for cooking. These ribs came out looking so meaty and tender! Thank you Cindy, these are delish! Darn I have been Missing out! 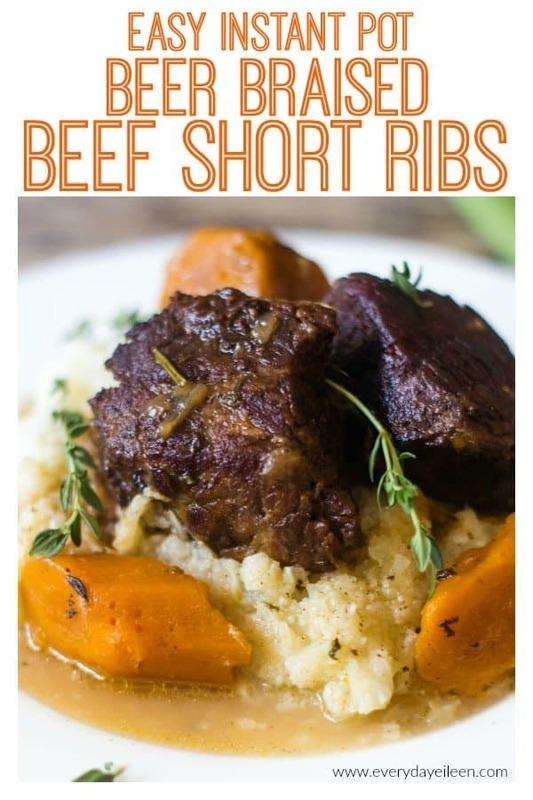 I never even heard of short ribs until you posted this now I am intrigued for sure to go find some and cook this! Claudia, you have to give short ribs a try! You will become a believer! I love short ribs. This looks like a fantastic comfort food recipe! I still don’t have an Instant Pot. But this recipe is certainly making me rethink that decision. Thanks for joining me for this event, Eileen. Thank you for hosting Camilla! I hope you get an Instant Pot, I have included the instructions to make the recipe in the oven. I hope you enjoy! Love short ribs and now, with the Instant Pot, we can enjoy them more often. Thanks for this great recipe Eileen. Thank you so much Wendy! I am glad you love the braised ribs in the Instant pot! OMG these look amazing! Love my Instant Pot and cannot wait to make these! Thanks so much for sharing. I hope you enjoy these braised ribs recipe! I can’t believe you can make this deliciousness so quickly and easily in the instant pot. I need to get myself an instant pot, obviously! Thank you Helene for your lovely comment! Yes do get an Instant Pot, In the meantime, I have included the oven directions in the blog post!